I will confess to a highly ambivalent response when it comes to novels that are written by authors who, for the most part, are poets. I am not a poetry reader, so that bias is admitted up front. Most often, I find that the language gets in the way of the novel — Anne Michaels’ The Winter Vault would be a good example. And then, just when I am getting ready to give up on poet-novelists, along comes something like Patrick Lane’s Red Dog, Red Dog and I realize I would be doing myself a tremendous disservice if I became so arbitrary. 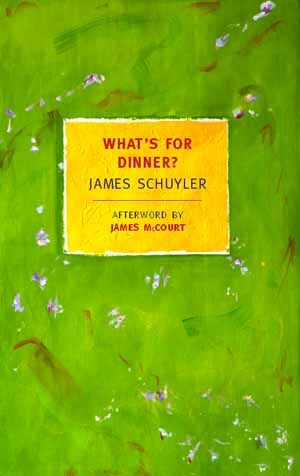 My poetry knowledge is so slim that I did not know James Schuyler was an outstanding poet when I ordered What’s For Dinner? — a recommendation from leroyhunter in a comment on L. J Davis’ A Meaningful Life was what put me on to the book. It was, leroy said, ” a study of suburban mores [with] a pleasant sharpness that is reminiscent of Davis”. That is as good a description as you could ask for — there are echoes of both Richard Yates Revolutionary Road and Mad Men, the television show, but more than anything else there is an exploration of New York suburbia in the 1970s. To fill in the background that I did not have: Schuyler is indeed a major American poet of the New York school with a score or so of published volumes to his credit. He was also W.H. Auden’s amanuensis, among other things. And he was a significant playwright; both the poetic and stage-writing talents come to play in this book. It was a lovely light living room. Or it would have been, had not a previous owner found quick-growing conifer seedlings an irresistible bargain. When the sun set, a few red beams would struggle in, disclosing in their passage the dust of which the air at times seems largely composed. Mary C. Taylor — the laughing Charlotte of the class of 19** — found the sweet mood brought on by contemplation of the spick-and-spanness in which her husband Norris perused and, presumably, memorized the evening paper, soured. “It seems to me all I do is dust this room.” She put on the bridge lamp at her elbow, in hopes of fighting light with light. “It isn’t dust, it’s pollen.” Norris was never so absorbed as not to leave a trickle of attention running. Lottie and Norris are childless; they have replaced the rigors of child-rearing with collecting (and dusting) knick-knacks and, in Lottie’s case, a dependence on the vodka bottle that will eventually see her checked into a rehab centre. The Delehanteys, by contrast, are a Catholic family with two teen-age, twin sons, who tend to dominate their attention. Father Bruce sees himself as a strict disciplinerian, monitoring and directing (mainly on the negative side) the boys’ musical, athletic and scholastic careers. Alas, like most parental intervention, his efforts are being overtaken by reality and the twins are growing up with the same kinds of distractions (say soft drugs) that most teenagers run into. Family three in the book actually isn’t a family it is a widow, Mag. Her husband’s death was pretty much a surprise and Mag is not yet ready to give up her life to widow’s weeds. That’s the framework for one half of the narrative of the book. The three family units interact with each other — sort of. Dinners are hosted, bridge is played and hanky-panky does develop. As the novel unfolds, Schuyler also spends a fair bit of time exploring the institution where Lottie has been confined, which has an entirely separate community of characters. “Bug you?” Mrs. Brice said. “We haven’t heard much from you, Mrs Judson,” Dr Kearney said. “I never did talk much,” Mrs. Judson said. As that excerpt illustrates, there is a somewhat painful slowness to this thread of the book but, to the author’s credit, it does eventually acquire a rhythm of its own, in contrast to the equally slow (but differently developed) world outside the institution. Like Yates (and Mad Men), part of what Schuyler is exploring is the inherent boredom of suburbia and life outside the institution is not that different from life inside it. I don’t think What’s For Dinner? is a great book, but it definitely is a worthwhile one — exactly the kind of volume that the NYRB should be ensuring stays in print. I am sure that, if you are a poetry reader, Schuyler’s poetry is a better investment of your time, but then I am not a poetry reader. In its own way, this novel captures the same kind of stasis that drives Yates’ Revolutionary Road and explores what kinds of outcomes that suburban stasis produces — with somewhat less disastrous consequences. Written in 1978, it captures that “bust” era — the liberation of the 1960s is now a fact, it has left some damage in its wake. In its own way, that has contributed as much to the modern world as the revolution of the sixties did — it is more than worthwhile to investigate how it looked at the time.